This is the view from our back window the day of the snowstorm. That is one thing we miss about snow--how nice it looks right after or during the snowstorm. After that--not so much. This is some of the ---"not so much." If you were wondering--we do not carry a shovel with us. But, the campground had these shovels for campers to clear out their fireplace coals and carry them in a fire bucket to a special dumpster. I wasn't the only one using the shovel for snow clearing. The whole day of snow, the temperature stayed around 30 degrees. Night temperatures were down in the 20's. Lady Blue--nice and warm. A kind of obvious note---solar panels produce zero electricity when covered by 9 inches of snow. So, after shoveling, it is necessary to climb ---carefully--on the roof to clear off the panels. During the storm, the 4,000 watt generator kept us all charged up. Once the storm ended, Jan and I could go walking. The roads were mostly dry and not slippery. 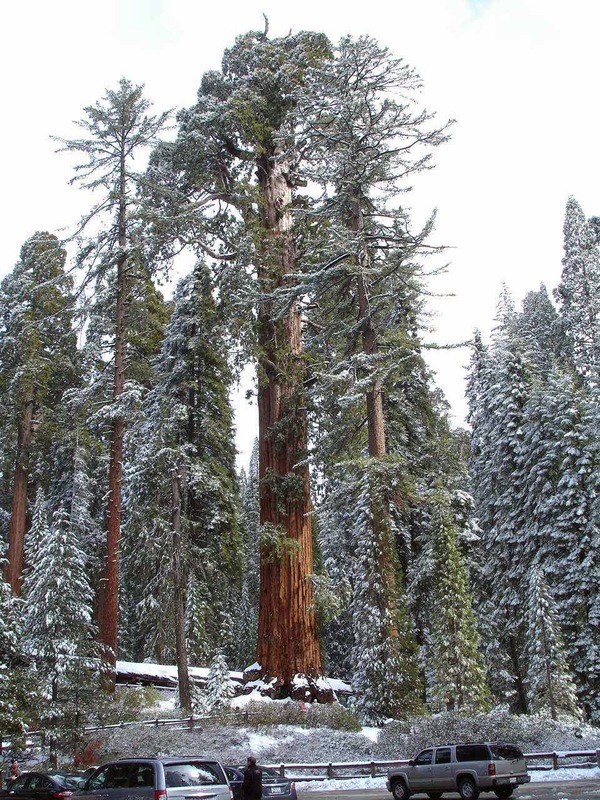 The young sequoias grow tall and narrow. They look great with the new snow cover. 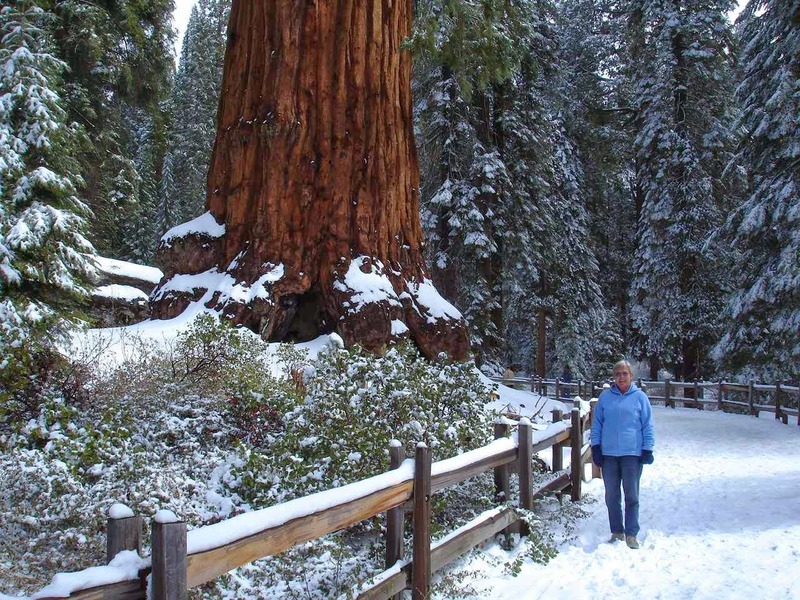 It's about a half hour or so walk to Grant Grove to see the General Grant tree. The older sequoias turn a great cinnamon color. 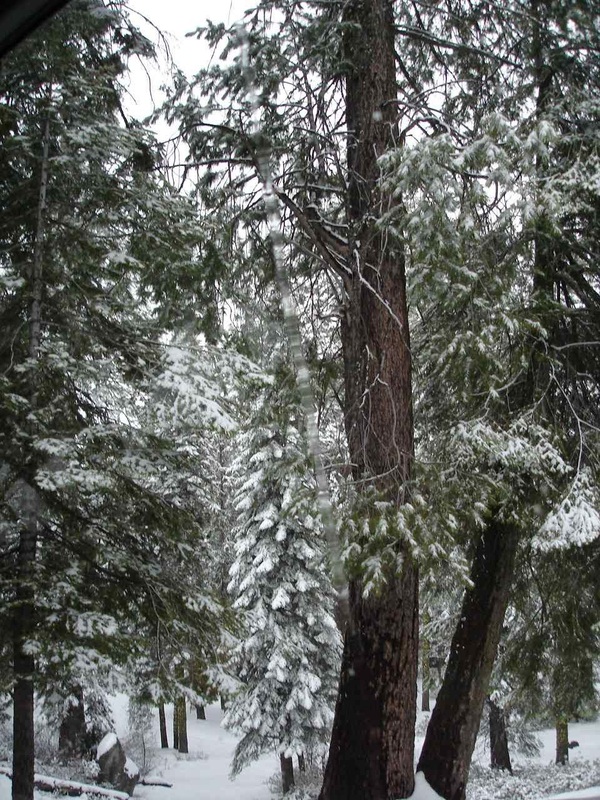 A perfect contrast to the green needles and the white snow. We were not expecting so many giants so close to our campground. Had to show the cars for a better appreciation of the tree size. Jan seems a little on the small side next to the sequoia. But , no, it's not a case of "Kids, I shrunk your Mom." General Grant is standing way behind the smaller trees. 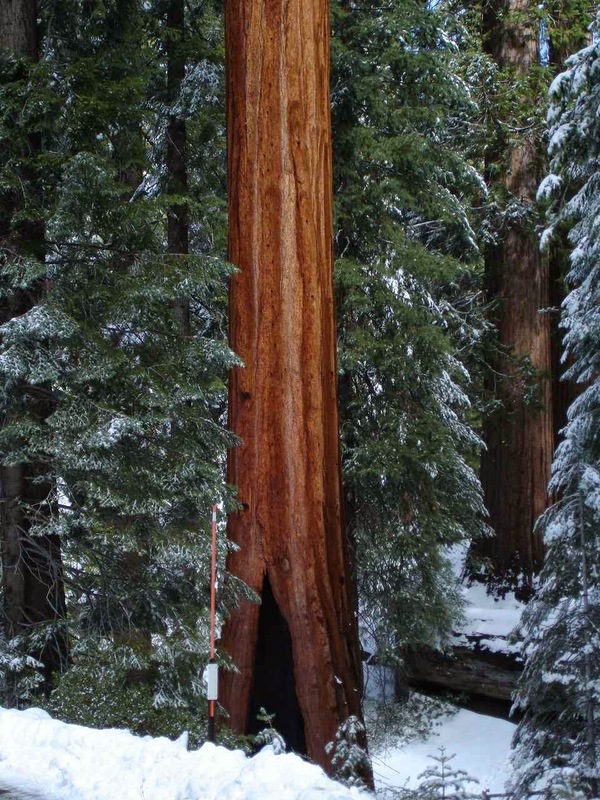 The General Grant tree is the second largest living thing in the world. 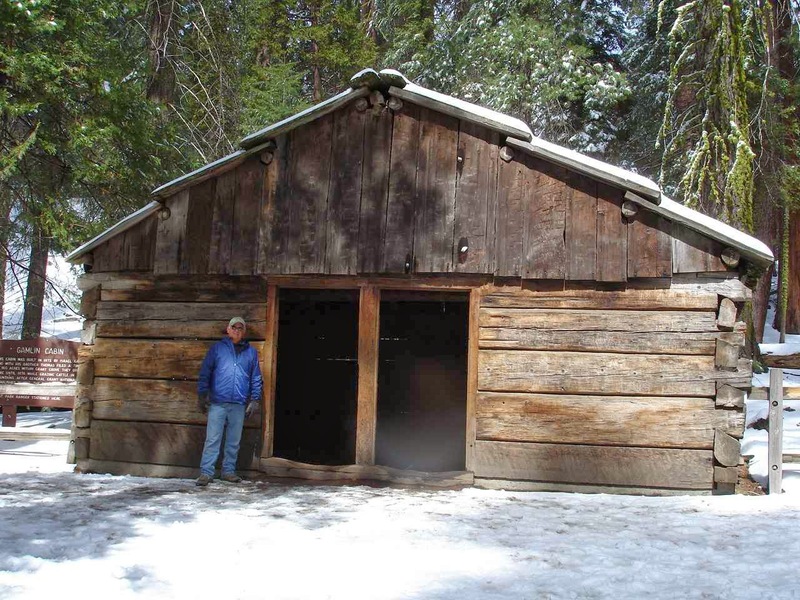 This is a cabin built in 1872 by Israel Gamlin. 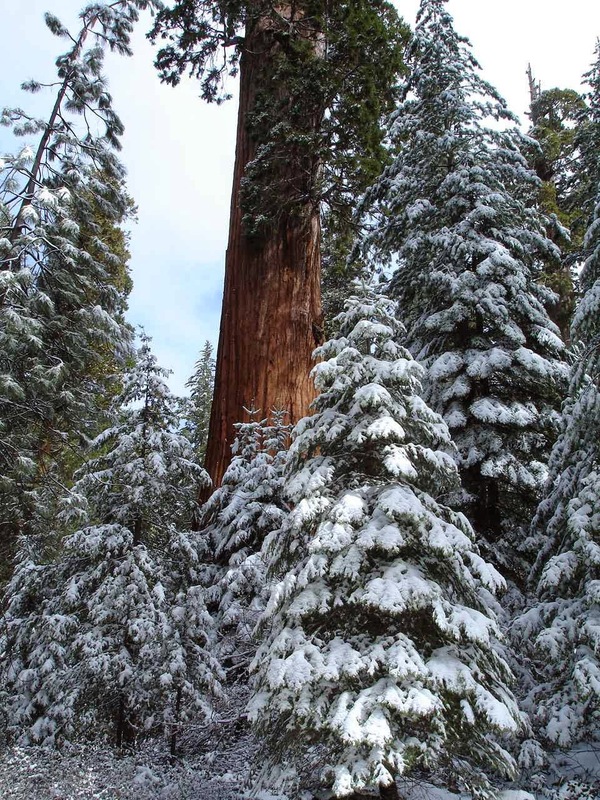 Israel and his brother were logging the large trees on 160 acres before the park was formed. It is amazing that most of the cabin is original although not all from sequoia wood. The cabin was used by the U.S. Cavalry while they were here patrolling the park--until 1913. It was also used as the first park ranger quarters. Right now, we are in another great Escapee park--The Park of the Sierras, in Coarsegold, California. That is on Route 41 about 20 miles southwest of the Yosemite National Park entrance. We arrived here this past Friday. But we had to keep an eye on the weather. 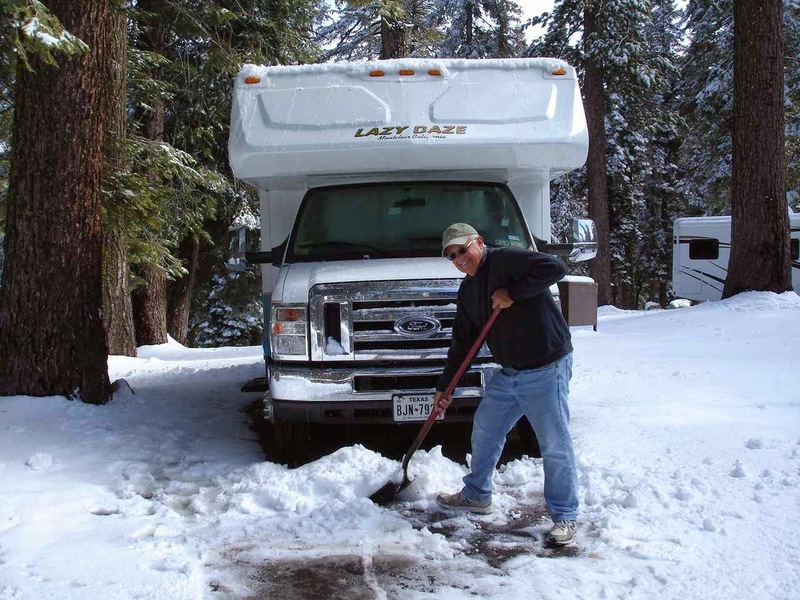 There were three snowstorms on the roads up to and into Yosemite, including 15 inches of snow last night. 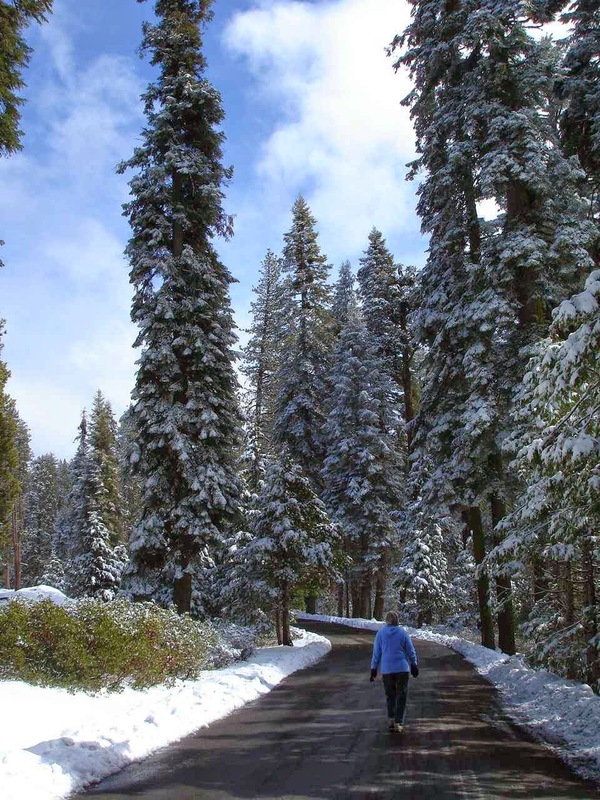 Roads are supposed to be good tomorrow and we learned that there are a number of cancellations at the campgrounds---so into Yosemite Valley tomorrow. We were considering a visit to Coarsegold and Yosemite but changed our minds due to the weather. We don't do cold very well! It's great that you were able to stay warm in that snow.